Tonight is the night! Our summer has officially come to a end. After months, and months, and MONTHS! The anticipation for this season to finally be over is here! (Thank the BB gods!) This season we have experienced #FingerGate, Vanessa's Mist, James's pranks, Audrey's Blanketing, and the multiple failed twists. But tonight that all ends! Either Liz, Steve, or Vanessa will walk out of the house $500,000 dollars richer and the Winner of Big Brother 17. (The runner up gets $50,000 & 3rd place gets $0). Continue Reading to see who I think will take it all home tonight! So here is how it will work, they will go head to head in part three of the HOH competition, live! That competition is usually a Q and A of phrases Jury members said about the season. The winner of that will then choose who they want to go against in the final two, thus evicting the other houseguest and making them the ninth and final jury member. The final two will then be interrogated asked questions by the jury. The jury will listen to the final two's plea speeches and then they will cast their votes for who they want to win. The winner only needs five votes to win! 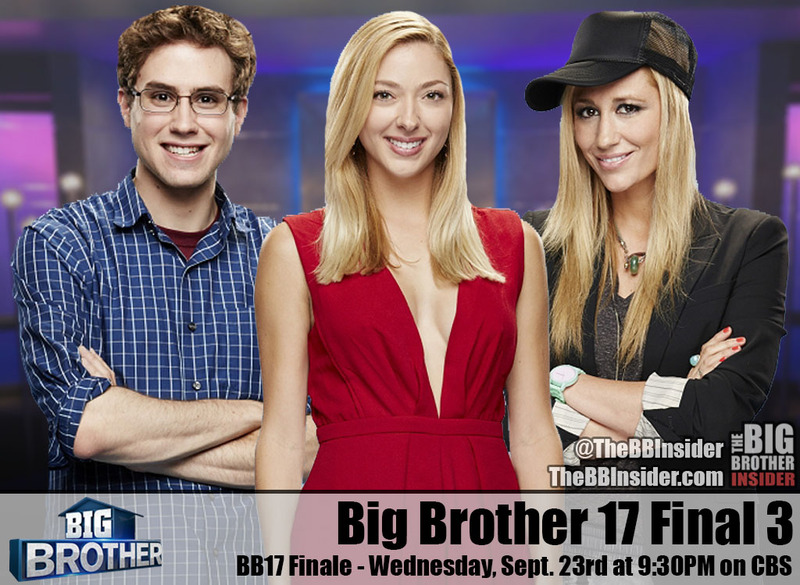 Jury Members (In Order): Shelli, Jackie, Becky, Meg, James, Julia, Austin, John, and the 9th jury member will be evicted LIVE! **Note: I usually try to predict how the jury votes will go for each person but it's incredible hard to tell who will vote for whom this season. I feel this season is particularly hard because I think Jackie, Meg, James (and maybe Becky) will all be voting together. They, in my opinion, will single handedly pick the winner. I have no clue if they will vote with their emotions and be bitter or if they will vote strategically based on who played the best game. Thoughts - I'm sure this is the scenario every Vanessa hater wants to see happen, and it's the scenario that WILL happen if Steve wins the Final HOH. The past few days, he has told the Live Feeders that he plans to evict Vanessa if he wins Part 3. If he does wins and does end up evicting Liz, it will be his biggest move and will completely blindside Vanessa. I think this will earn him a win in the eyes of the jury. Thoughts - This is a very tricky scenario to predict because I can't tell if the Jury plans to vote emotionally and be bitter or if they plan to vote strategically based on who played the best game. If they vote with their emotions and are bitter, Steve easily takes the win. However, if they vote based on game, Vanessa should pull out the win. Either way, this will be a very exciting scenario to watch if it happens. Also, it will make the most amount of fans happy as most (I am one of them) believe Vanessa and Steve deserve F2 over Liz. Thoughts - In this scenario, Vanessa will (or should) very easily win. In my opinion, the jury doesn't see that Liz did much of anything this summer. She will have to really convince the jury in order to pull out a win in this case. This is Vanessa's best case scenario to win. Liz should win because... Although Liz hasn't played a (what I consider) "great game" this season, she still has lasted despite having the odds stacked against her. Not only was Liz in a showmance, but she was a part of a twist...a TWIN Twist! Having a showmance, which is nearly impossible to make it through the whole game together (which her and Austin nearly did), already stacked the odds against her. Having a twin sister playing the game as a part of a twist AND surviving with her til Final 6 is truly amazing. Now, I don't think her surviving theses odds was anything by her doing. I think we just have had a cast of idiots who didn't see these issues until it was too late. However, that being said, I am truly shocked Liz has made it this far and although doesn't deserve to win, in my opinion, does deserve the place in which she'll likely hold...Third. Steve should win because... He has played the "Ian Terry" type game quite well. Although Steve hasn't made any huge moves when he was HOH (taking out Jackie, Julia, and accidentally John) I feel he has more than deserved 2nd place. Steve has never had it easy this season, if you recall he was the target Week 1 but he won Veto. I've always seen him as the underdog and although he has played a rather quite game I think he has played it better than Liz. If in some odd way he ends up winning, I wouldn't mind and would respect him as a winner. Vanessa should win because... She has played the best game this season. Hands down. You can't deny that she has controlled the majority of the evictions this season. Not only did she usually manage to get whomever she wanted evicted, but she was able to play a phenomenal social game as well. Her fabulous social game was put on display in Week 11 when she was able to talk Julia into going up against Austin in that POV competition. After that, I was left in shock and awe of Vanessa. She was able to do amazing damage control afterwards and somehow even got Liztin to break up... for a few hours. How she managed that? I'll never know. Some may criticize her game because she cried a lot, and didn't own up to her game play in the DR. I agree, she should have owned up to her game. That was her biggest downfall in winning over America. However when people criticize her game because she, "Cried WAYYYY to much. She's a cry baby." I can't help but laugh. Crying is a strategy, whether you like it or not. Her tears obviously worked on her houseguests because she's sitting in a fairly good spot to win the game, and I think she's more than deserving of the win. I am full on rooting for a Vanessa win tonight. However, my gut tells me, we will end up having a repeat of Big Brother 14 Finale. 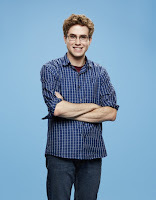 Vanessa (Dan) and Steve (Ian) will end up going to Final 2 and Vanessa will end up loosing like Dan did due to a bitter Jury, thus making Steve the winner. Although, I hope that doesn't happen tonight, my gut tells me it will. However, if Steve pulls out the win in Part 3, it will be very exciting to watch him blindside Vanessa. If he does that, he will earn his win, in my opinion. As for who I think will win "America's Favorite Player", its a toss up between Johnny Mac and James. Both, in my opinion, deserve it. However, as the feedsters know, James provided the most entertainment in the house and he took out the biggest targets when he was HOH. For that, he deserves the win more then Johnny Mac does. "We Want YOU to WIN!" Results: You want Steve to win! He received 68% of the votes! Thanks for reading and thank you for being a loyal fan of TBBI this season! I haven't enjoyed this season as much as past seasons but I am looking forward to returning for Big Brother 18!